Launchrock is an online tool designed to help businesses and professional individuals capture email addresses and create online product launching events with the high probability of going viral. This viral marketing platform enables you to build a site that is solely intended for early customer acquisition, aiming at gathering existing customers and potential buyers who might be interested in getting your new product or service way before you introduce it to the market. Easy to use and implement, you can create 100% responsive websites without any fuss and difficulty. Launchrock comes with three set of tools to ensure the success of your product launch – Build, Promote, and Analyze. You have a modern block-based builder with WYSIWYG and Custom HTML blocks that helps you create websites based on your preferences and requirements, social network sharing capability to help you reach out to your intended consumers, and a comprehensive suite of robust analytics to assess the performance of your product launch. For product launches to be successful, you have to build up the momentum and surround your product or service with such hype to pique the interest and curiosity of your intended consumers. Also equally important is you getting their contact information so you can deliver them the latest news and updates on your product and on the launch itself. 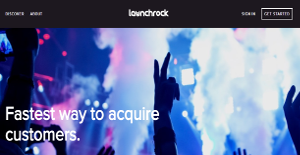 Launchrock gives you the essential tools to ensure the success of your product launch. With its very intuitive block-based website builder, creating websites that reflect your brand. Its WYSIWYG and Custom HTML blocks allow you to build fully custom and effective websites for marketing and contact information capturing purposes. Marketers will also appreciate how fully responsive Launchrock websites are. Whether your target customers are viewing your sites and content from a desktop or a mobile device, you can be sure that they are getting a smooth, seamless interaction and viewing experience. Once your site is ready for dissemination and marketing, you can fully leverage the power of social media to greatly extend your reach. All Launchrock sites can be shared easily on all social networks, making it easy for your customers to access your site and share it with their circles. This results in better reach and it also generates momentum for your product launch. If you are considering Launchrock it might also be a good idea to investigate other subcategories of Best Content Management Software collected in our database of SaaS software reviews. Every enterprise has different requirements and requires an application that can be customized for their size, type of workers and customers, and the particular industry they are in. For these reasons, no platform can offer perfect functionality off-the-shelf. When you try to find a software app, first be sure what you need it for. Read some Launchrock reviews and ask yourself do you want basic functionality or do you require advanced tools? Are there any industry-specific functionalities that you are searching for? Find the answers to these questions to help your search. There are lots of elements that you need to mull over and these include your budget, specific business requirements, your organization size, integration requirements etc. Take your time, use a few free trials, and finally choose the app that offers all that you require to enhance your company effectiveness and productivity. We realize that when you make a decision to buy Content Management Software it’s important not only to see how experts evaluate it in their reviews, but also to find out if the real people and companies that buy it are actually satisfied with the product. That’s why we’ve created our behavior-based Customer Satisfaction Algorithm™ that gathers customer reviews, comments and Launchrock reviews across a wide range of social media sites. The data is then presented in an easy to digest form showing how many people had positive and negative experience with Launchrock. With that information at hand you should be equipped to make an informed buying decision that you won’t regret. What are Launchrock pricing details? What integrations are available for Launchrock?